Did you hear that? That was the sound of a couple more drops into a bucket. Worse, there’s a hole in it. The UK’s deputy Prime Minister, Nick Clegg announced in Bristol today that the equivalent of less than 1% of the Highways Agency budget; or 7 miles of new motorway; or 1 mile of the 73 mile CrossRail project; will be split between the Highways Agency and the same 8 cities in the UK, who already receive funding, so that they can continue their slow progression of making their road networks fit for humans. And it is slow progress: some of the campaigners in those 8 cities have expressed concern over how the existing money has been spent already (or not!). Moreover, the £214m announced today is spread over the next 3 years. Oddly, the government says that brings the total spent by the government to £588m. My maths find a different result: £437.6m, as stated on 6 November by the minister, plus £214m announced today, equals £651.6m. What’s a £63.6m difference, eh? You couldn’t even get a pint of bitter in a London pub for that! A growing number of people, including me, no longer pat the government on the back for these condescending amounts announced from time-to-time. Instead we are demanding a reallocation of existing money to schemes that give a 5:1 return on investment (actually 5.5 : 1) and sustained over a long-term. The money would be spent to make roads fit for humans: they must urgently be brought up to a Dutch standard. Doing that will fulfill the Get Britain Cycling inquiry’s target of getting 25% of people cycling, sooner rather than later. 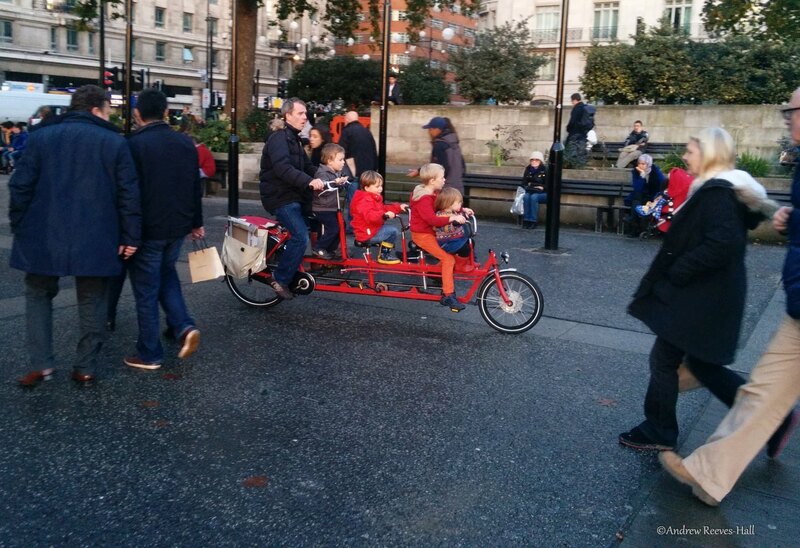 Sometimes campaigning is soft: asking for Space for Cycling. 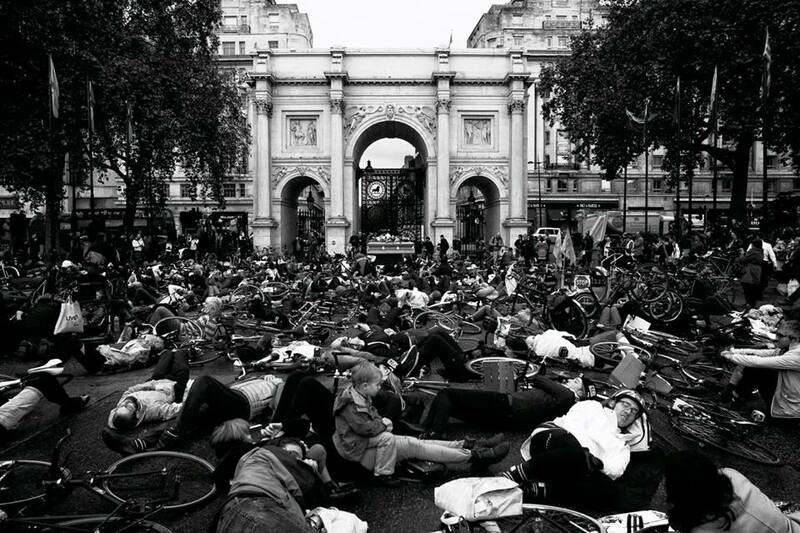 Sometimes it is more radical: staging a Die-In, like the Dutch did in the early 1970s, and making 10 Demands on our governments. 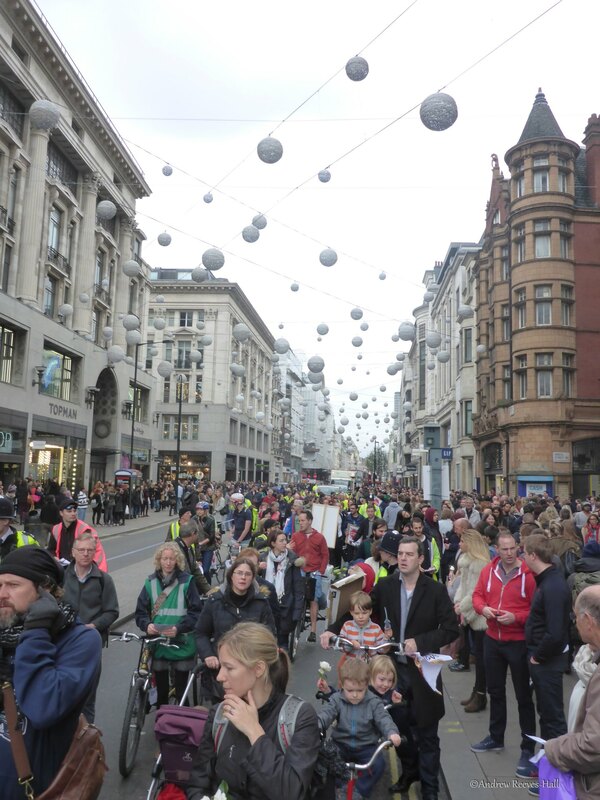 Hundreds of people marched down Oxford Street earlier this month demanding the government invest in roads infrastructure. The government in The Netherlands spends roughly €26 (£21) per person per year on cycling – with the money coming from more than just the transport department. The Get Britain Cycling inquiry recommended that the government spend £10, rising to £20, per person per year on cycling. £1.37 per person per year on average. That’s worth repeating: we go from £1.37 per person per year to £1.27 per person per year! And that assumes there is no change in the population! What this country needs is a flood of investment. Children joined in the direct action to demand roads fit for humans. The Department has recently consulted on future funding for cycling via the draft Cycling Delivery Plan. 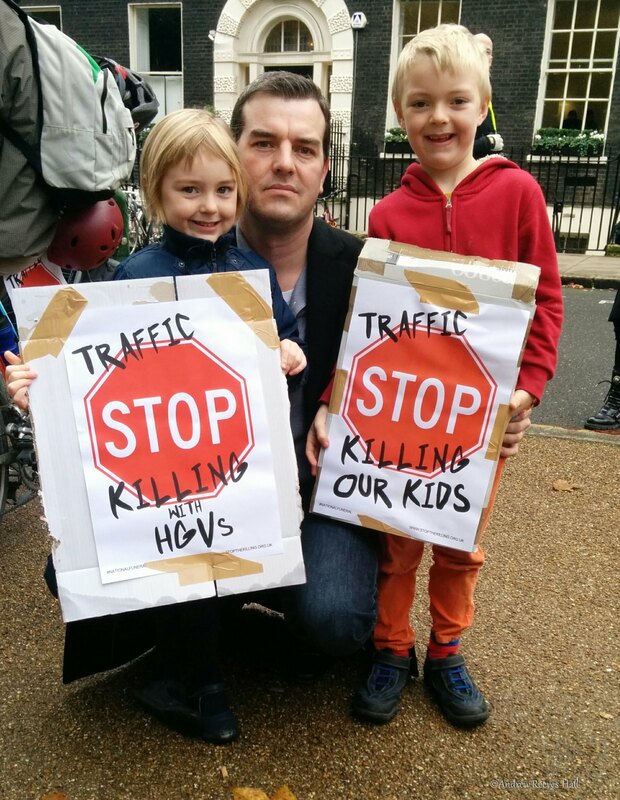 The consultation closed on 27 November 2014 and I will be in a position to provide a fuller answer to this once this consultation process has been completed and the final Cycling Delivery Plan has been published.